Have you ever felt ready to mix things up in your life and make a change? That’s where we’re at right now. We’re looking for a new adventure, and not just a mini camping excursion or road trip this time. In fact, we’re considering selling our house and moving. Mike and I are very interested in moving somewhere that is walkable. Right now, we live in the Las Vegas area suburbs. We own a tract home that is barely walkable to anything and sits far away from the core of the city. This means like many Americans, we have to drive everywhere to get anywhere. But in all honestly, we’re tired of that, and want to try out a different lifestyle from what we’ve always known. If you’ve never read the book, “Walkable City,” and are into urban planning, I highly recommend it; I couldn’t put the book down. The information presented on how our cities and neighborhoods are set-up, and how to improve them, was a big eye-opener for us. There is also a fascinating Ted Talk on the subject of the enormous benefits of living in a walkable community. After renting some vacation places in walkable areas, reading up on the subject, and watching Jeff Speck’s Ted Talks, we decided that living in a walkable neighborhood is something we want to pursue, if possible. So off we went this last Saturday with a realtor, to check out some condos in a walkable area of downtown. The condos are very nice at the Ogden. They are essentially “lock and leave” units with secured entry into the building. The views from each condo are outstanding. You can see downtown Las Vegas, there are some Strip views, views of mountains, and most units have floor-to-ceiling windows. All of the units have balconies, modern kitchens, and well-designed layouts. There is also a rooftop deck, a year-round pool, an exercise room, and other nice amenities. We especially liked the Ogden because the condos are within our budget (lowest current list price is $235,000), it’s in an energetic place, and it’s potentially a great investment. Downtown Las Vegas is continually growing and changing – we think for the better. There is now a grocery store downtown, there are green bike lanes everywhere, there are local, fabulous restaurants going in all the time, and the city is working towards revitalizing the area. I must admit, I am not completely sold on moving to downtown Las Vegas. It’s something I will have to think long and hard about, as well as consider the pros and cons over several discussions with Mike. As much as I think it would be an exciting and unique experience for us to explore living downtown, I am a little worried that the location might be a bit chaotic, touristy, and too-high energy for us as a full-time home. I also really struggle with the extremely hot temperatures in Vegas during the long summer months. If there was a way to escape the summers out here, that would be my personal preference. But, the Ogden is definitely on our list of serious contenders because Mike likes the idea of living downtown. I also like that it’s walkable, and a new experience, with beautiful, expansive views. Mike, enjoying the rooftop deck and pool area. 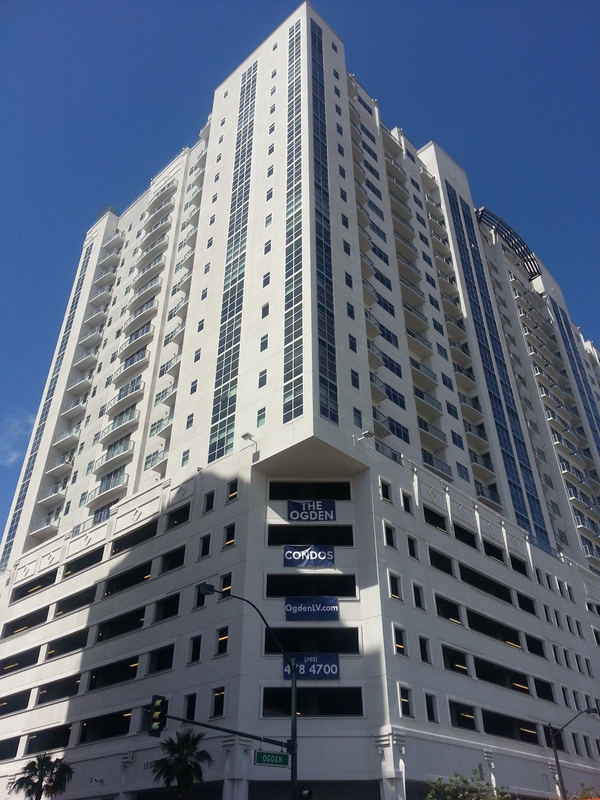 Pictures of the Ogden condos, downtown Las Vegas. Downtown Las Vegas, with the Ogden condos in the background. 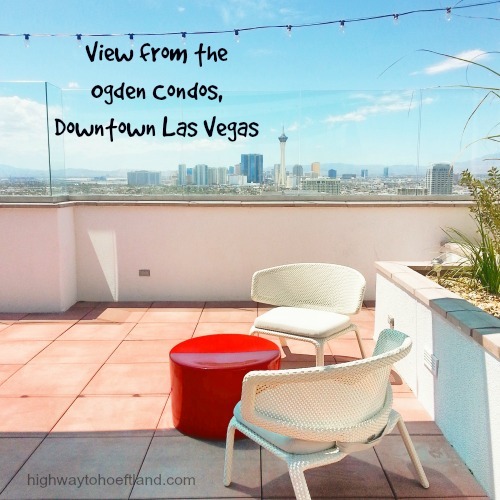 Looking at the views from the Ogden condos. View from inside a condo. We also want to check out some other walkable neighborhoods, in entirely different cities. Next up, we’re going to finally check out Bend, Oregon—basically the complete opposite of living in the Vegas area. The following post will be all about how we liked the medium-sized central Oregon town and what we did while there. Note: We will not be taking the Casita on this trip to Bend because we have limited time now. We’ll be flying and staying in a small house. Hmm, interesting. Personally I don’t think I’d like living FULL time in downtown Las Vegas. It would make a great second home with vacation rental opportunity. I look forward to hearing what you think about Bend. I haven’t heard one negative thing about the place. Maybe you might want to think about renting downtown for 6 months to a year. Sell your home and rent. If you like it then you are right there to find your perfect condo. If not, well you got to spend time living downtown. Have to walk the dog, but then being outside is the idea. Also, leaving a condo is soooo much easier than leaving a house. You might also want to think about a different downtown city like Portland, Seattle, Bend or San Diego. Of course they all have their attributes and deficiencies. At least here in Nevada we have a great income tax structure and the real estate market here is coming back! Bend is a great place with lots of outdoor activities.